Our raw material is aluminum oxide, also called alumina, a compound of aluminum and oxygen. It is a grey-white fine-grained sand that we import in triple the amount of the aluminum that we produce. Aluminum oxide is made from bauxite, a red mineral that is commonly found and easily processed in Australia, Guinea, South-America and many places in Europe, and that is named after the French town Le Baux. 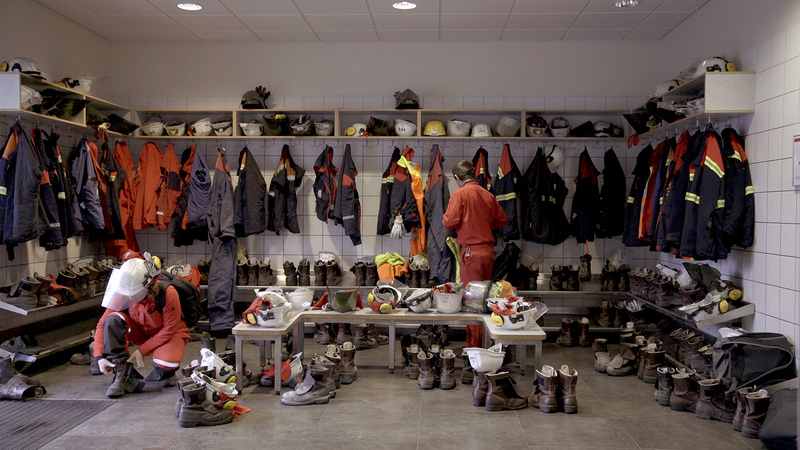 In 2016, we produced 313,000 tons of pure aluminum at the Grundartangi plant, using 4.66 GWh of electricity – almost a quarter of all electricity generated in Iceland. This represent an increase from 2015. Our main raw material is aluminum oxide, often known under the name alumina, a compound of aluminum and oxygen. It is a grey-white fine-grained sand that we import in double amount of the aluminum that we produce. Aluminum oxide is made from bauxite, a red mineral commonly found and easily processed in Australia, Guinea, South-America and many places in Europe. The aluminum oxide is so fine-grained that we can literally vacuum it up from the vessel and to a storage silo and from there all the way to the pot rooms, in a closed system. Every pot contains 20 electrodes that are replaced every 30 days. The electrodes are attached to the anode rods in the rodding shop before they are established in the pots. Every new electrode weighs approximately 1200 kilos but gradually dissipates and after use weighs approximately 250 kilos. The electrodes are transported back to the rodding shop where the remains are cleaned from the anode rods, crushed and sent abroad where they are recycled as material for new electrodes. Every new electrode is attached to the anode rod and the process is repeated. Every pot produces approximately 1.5 tons of aluminum per day. The aluminum is transported to the casthouse where the metal is collected into furnaces which each can hold 60 tons. When the metal has reached its optimal temperature (720°C) the furnace is raised and the metal poured into casting moulds and moulded into 22 kilo slabs. The slabs are then bound in stacks that weigh approximately a ton and transported in that form to the markets in containers. Our main product is pure aluminum that is sold in international markets and used for all kinds of manufacturing. Most aluminum products that we know — cans and various kinds of packaging, construction materials, car rims, bicycles and computer cases — are made from alloys where aluminum is the most dominant ingredient but other metals are combined with the aluminum to make it stronger, increase the carrying capacity, increase or decrease the melting point or create other special characteristics. The most common metals used in alloys are copper, magnesium, manganese, silicon and zinc. Our aim is to be the leading company in our field, show a good example when it comes to safety and environmental matters and be an attractive workplace. 1995 Preparations for constructing a new aluminum plant begin at CVC Inc. (Columbia Ventures Corporation). CVC is owned by Kenneth D. Peterson jr. and its headquarters are located in Washington in the US. 1996 CVC decides to expand its operations from the US and Iceland is chosen as a location for a new plant. 1997 Building of the aluminum plant in Grundartangi begins in April 1997. 1.500 applications were received for the 150 jobs available. 1998 The first pot started, only 14 months after construction began. The Hvalfjarðargöng Tunnel opened on 11 July. Environmental monitoring begins. 1999 Production capacity in the first phase was approximately 60.000 tons. 2000 Number of employees reaches 220. They mostly come from the surrounding municipalities and from Reykjavík. A bonus system is implemented. 2001 The second phase is started and the production capacity reaches 90.000 tons. „The Bath“ is established and employee facilities are greatly improved. 2002 Norðurál and Landsvirkjun, the National Power Company in Iceland, sign a power purchase agreement due to expansion of operations in Grundartangi from an output of 90.000 to 240.000 tons per year. 2004 Century Aluminum buys Norðurál on 16 March. Construction work for the third phase begins on 7 May. 2006 The production capacity increases to 220.000 tons. Number of employees reaches 320. 2007 The pot room is finished and the production capacity is 260.000 tons. Number of employees is 480. 2008 Norðurál´s 10th birthday celebrated with employees friends and families at Grundartangi. 2009 The "Bath" is expanded in order to meet the demands of an ever-growing work force. There’s plenty of clean hydropower and geothermal energy in Iceland. Production of alminum demands a lot of energy as a great deal of power is needed in order to separate aluminum from oxygen in aluminum oxide, which is our raw material. Very few aluminum plants have access to energy that is as environmentally friendly as ours. We convert clean, Icelandic power to a high quality and valuable export product with a far smaller carbon footprint than almost all competition can offer.